I have to admit I’m not quite sure what this is. I came across it from a link somewhere (and have unfortunately forgotten the connection), and bookmarked it under “cool drawing resource”. Carracci was a 16th Century Italian master renowned for his beautiful frescos and paintings, and credited with inventing caricature in the modern sense. It is his drawings I have always noticed, though; they stand out even among other great masters of the time. 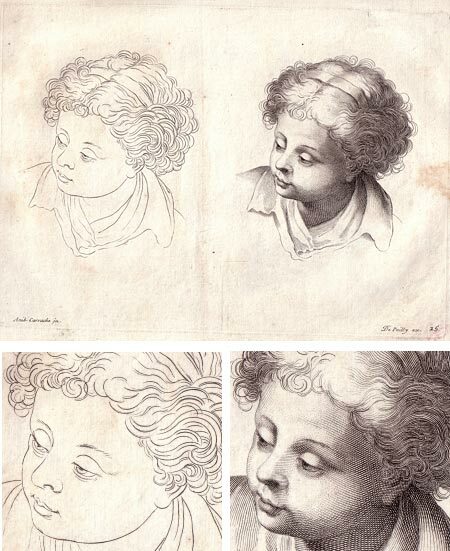 The pieces on this site are from a book that looks like it may be a drawing manual based on Carracci’s drawings, featuring both light outline drawings and finished renderings, presumably by a later French artist, of faces, facial features, hands, feet and other items related to drawing people. Though not as beautiful as Carracci’s delicate and subtle drawings in red chalk, these engravings are particularly interesting for the contrast between the lightly rendered and fully rendered versions, and the instructive array of eyes, ears, mouths and other features. It should be as useful to artists today as it was 400 years ago. OK, I’m going to divide you into two groups for this tour. Those of you who think you don’t like comics (possibly because you associate them with bland newspaper strips and endless arrays of costumed superheroes), please get on the bus labeled “Quick Tour”. You should at least take a peak at this, even if just out of curiosity. You may find that your image of comics is unnecessarily limited and discover some wonderful visual art you’ve been missing out on. I will suggest those of you who love comics, but limit your appreciation for them to modern superhero comics, join the first group on the “Quick Tour” bus. In the other group are those of you who love comics and revel in the wide spectrum of accomplishment in this amazing and unbounded art form, along with those who are simply adventurous in terms of your appreciation for visual art. I will ask those of you in this group to pack a lunch, sign a waiver releasing me from responsibility for exposing you to a major time sink, and get on the bus labeled “Magical Mystery Tour”. Both groups may find their eyes opened about what “comics” are, have been or can be, and may allow themselves to be dazzled with some of the oldest, weirdest, and finest examples of this wonderful medium. Andy Konky Kru (Andy Bleck) has compiled an amazing archive of “early comics”, hosted on the site of Bugpowder, a collaborative weblog devoted to the UK independent comics community. If, like me, you think of “early comics” as being the wonderful work from the late 19th and early 20th Centuries, you will be amazed and delighted to find that Andy’s collection begins in 300 A.D., and includes examples of “comics” (which has been defined as images in sequence, often combined with words, that tell a story) from the dusty centuries of the dark ages, the flowering of the Renaissance, through the 18th and early 19th centuries and up to the early 20th. He leaves off at around 1929. For those of you on the Quick Tour, don’t miss the transcendently amazing work of Winsor McCay (see my previous post), George Herriman (and here), and Cliff Sterrett . You might also want to check out modernist artist Lyonel Feininger and wonderful oddities like Gustav Verbeek and Hubert Crowley. Those of you on the “Magical Mystery Tour” will find prime examples of favorites as describe above, the expected landmarks like Wihelm Busch, Rudolph Dirks, Frederick Opper, Richard Outcault, Frank King and others, but you may also encounter surprise treasures like Harry Grant Dart. Aficionados of the great illustrators will find unexpected examples of “graphic stories” by such luminaries as Howard Pyle, Gustav Dore, Augustus Egg, Heath Robinson (and here), A. B. Frost, John Held Jr., Ernest Shepard and John Tenniel. There is a handy chronological index at the top of the pages. The index page has a more descriptive listing of the periods. My only complaint is that, in what I assume is an effort to make them easier to read on web pages, Andy has taken the liberty of rearranging the panel layout of many of these comics and placing them in vertical stacks, sometimes missing their titles. I would much rather scroll around if necessary to see them in their original layout, but this is a minor quibble and pales in the light of what a tremendous service he is providing with this archive. 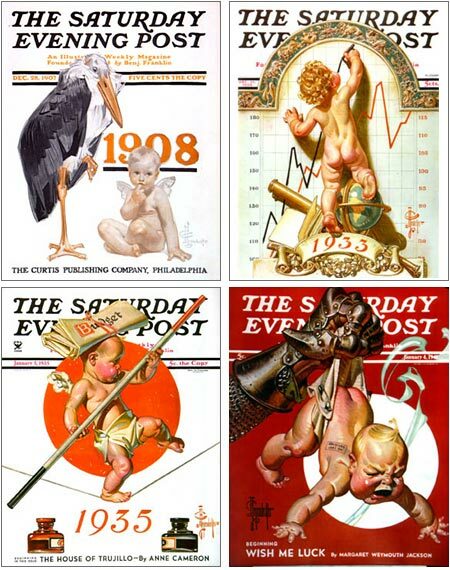 Here’s an opportunity to see these gems on the web, large enough to be close to their original size in early newspapers and book printings, and you can search them out in their original form elsewhere once you find yourself fascinated. While the archive isn’t complete, and is weak in some areas (E.C. Segar for example), I assume this is a work in progress; and on the whole, Andy has picked superb examples of these artist’s works. It’s an amazing resource and an absolute delight. Andy has also provided articles on speech balloons in cartoons and comics and an index of comics without words in his archive. He also provides listings of books with reprints of early comics and over 500 links to comics resources. If that weren’t enough, Andy’s own paintings, drawings and travel sketches (and here) are quite nice and worthy of a visit on their own. Whew! I’m glad I had you sign those time sink waivers. 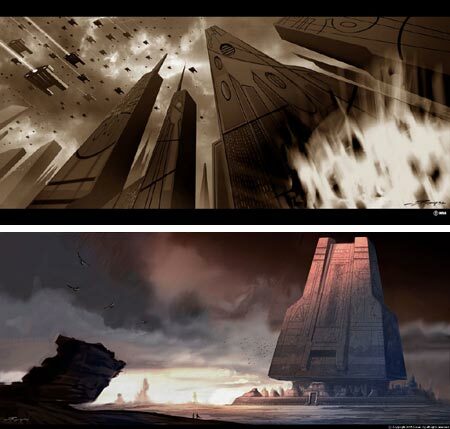 Simon Rodgers is a concept artist for the film industry. Aside from that I know very little about him. Rodgers’ blog features mostly quick (but wonderfully realized) studies and concept sketches for personal projects, speed paintings and other work done primarily for fun or exercise. There are occasional concept illustrations, though, for an unspecified “Conan project” (image above, bottom) that looks fascinating from the scale and imagination conveyed in his images. There are also hints of several personal projects of his, including a children’s book, that I hope see completion, just because the concept illos look so cool. Maybe Rodgers will eventually add a little bio to his blog, so we know more about who he is and what’s he’s worked on, but in the meanwhile he’s giving us some tasty eye candy. If Indiana Jones had been equipped with a sketchbook and watercolor kit instead of his famous whip, he might have been Frederick Catherwood. Catherwood was an English architect and artist who traveled to Central America in the mid-1800’s with a writer named John Lloyd Stephens to create a book on the ancient Mayan ruins, which had been previously documented, but not in detail. They were astonished by the ruins of of the Mayan’s monumental structures, and did their best to convey that astonishment in their book. If the camera lucidia makes some aspects of seeing a scene easier, all other conditions for making these works were far from ideal. These were treks into remote regions in thick jungles in oppressive heat and humidity amid malarial insects, dangerous swamps, torrential rains and local civil war. The book published by Stephens and Catherwood on their return, Incidents of Travel in Central America, Chiapas, and Yucatan, featured lithographs made from Catherwood’s drawings and was an immediate success. Catherwood was trying for both scientific accuracy and for the drama of the magnificent ruins, and accomplished both. The pair returned to the Yucatan and released another book, Incidents of Travel in Yucatan 2 years later, which Catherwood followed a year later with Views of Ancient Monuments in Central America, a collection of 25 color lithographs made from watercolors he painted at the various sites. Catherwood had made previous trips to the Eastern Mediterranean to draw the monuments of Egyptian, Carthaginian, Phonecian and Greek civilizations, and was the first ‘”infidel” to enter the Mosque of Al-Aqsa and made the first architectural drawings of its interior. A large number of his original drawing and paintings were lost to fire while on display in New York, but many remain and are often more detailed than the engravings created for publication. There are some books about him, including The Lost Cities of the Mayas: The Life, Art, and Discoveries of Frederick Catherwood by Fabio Bourbon, and there are modern editions (though still out of print) of Views of ancient monuments in Cental America, Chiapas and Yucatan, Incidents of Travel in Central America, Chiapas And Yucatan and Incidents of Travel in Yucatan. Erratum: As Daniel van Benthuysen was kind enough to point out, I was off in my description of the camera lucida, I read “camera lucida” in a bio of Catherwood and in the bleary early morning hours, saw “camera obscura” in my head. Catherwood used a camera lucida, Vermeer a camera obscura. See the comments page for this post to read Daniel’s excellent description of the two devices. 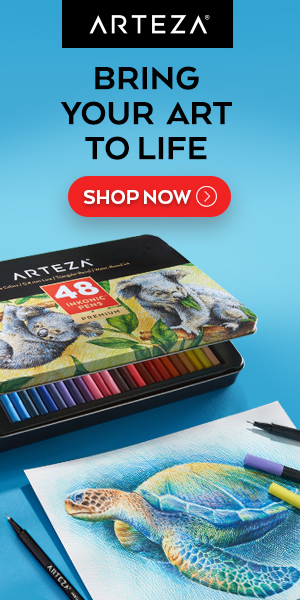 (If you’ve ever seen those ads for those spindly little devices that promise to let you “Draw anything!” in silver age American comics, that’s essentially a camera lucida.) Just goes to show that I’m more obscure then lucid in the mornings. A tip of the hat to Johnny at Drawn! for their recent mention of my post on Illustrators’ Visions of Santa Claus.. This seems a convenient time to mention Drawn! again. For those of you who aren’t already regular readers, the promise of a little time off over the holidays may be opportune for getting lost in their regular posts, and enormous archive of previous posts, about terrific illustrators, cartoonists, comic artists, animators and all manner of other artists. See my previous post on Drawn! and my thoughts on why most readers of lines and colors should find it a tremendous resource and great fun.